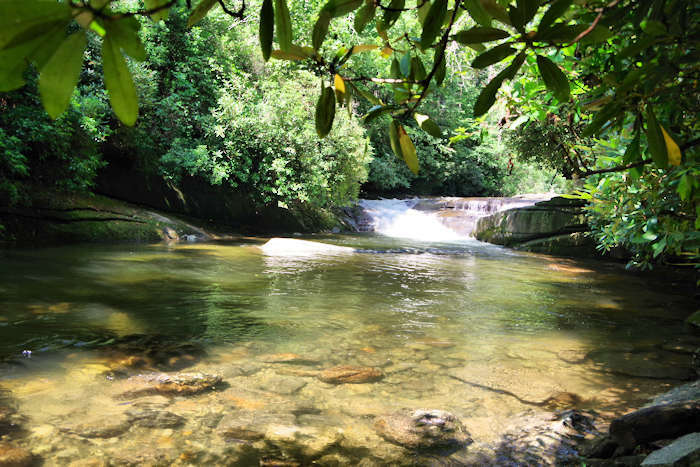 About 5.5 miles from the super popular Sliding Rock is a hidden, peaceful swimming hole deep in Pisgah National Forest near Brevard. A refreshing cascade flows into the 40-foot long pool, surrounded by boulders. Above the cascade find some sunning rocks. Located on the Davidson River, it's named the the "whaleback" looking boulder in the middle of the pool. It's a short walk from the road. 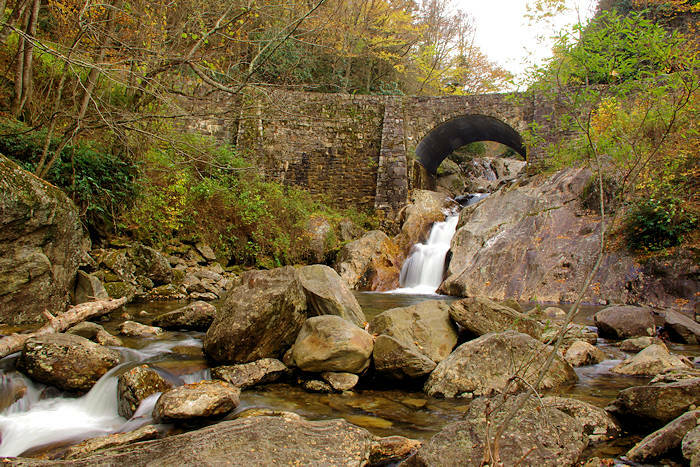 The pool access is across from the trailhead to one of our favorite hikes to Cove Creek Falls. From the parking area, follow a trail along Cove Creek down to Davidson River. The skinny trail takes you through a forests to several openings along the river. 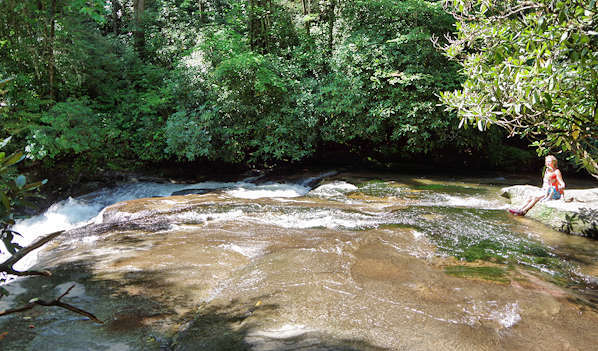 Whaleback swimming hole is just below the junction of Cove Creek into the river. The first of the side trails go to the area above the cascades with great picnic and sunning rocks. Do not get in the water above the cascades since you could slip and get injured going down the cascade. In the photo above, the water was a little high due to lots of rain. Usually, there's plenty of space to sit and enjoy the scenery. To reach the pool, continue on the main trail down river past a camping spot. Look for a very short but steep trail down to big boulders by the pool. The rocks can be slippery when wet. This swimming hole more for splashing and wading. There's no sandy beach or place for diving or sliding. It's mostly known to locals. Often, there are few or no visitors especially on summer weekdays. 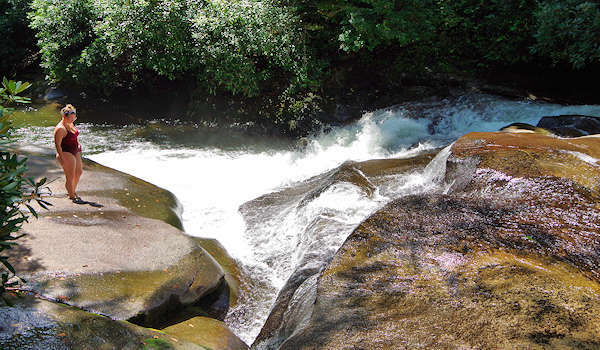 See more of our Top Swimming Holes in the NC mountains. For a very scenic hike, cross the road from the parking area for the trail along Cove Creek past several cascades and waterfall. 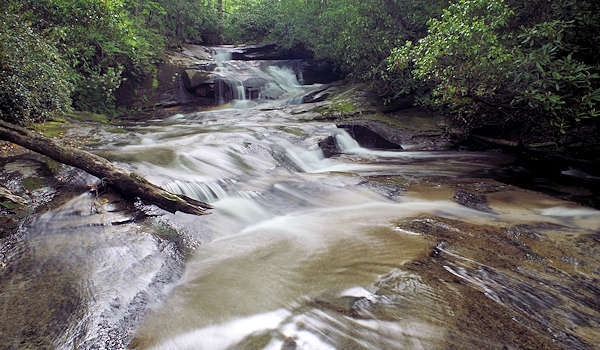 See our Cove Creek Falls Guide. 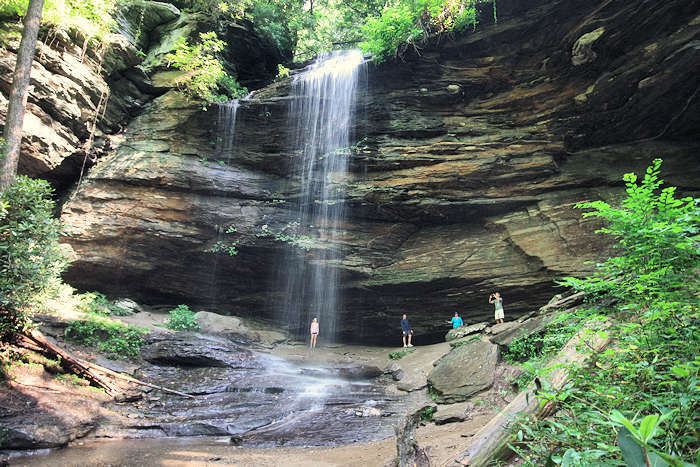 Also nearby are Daniel Ridge Falls and hikes to John Rock and Looking Glass Rock. 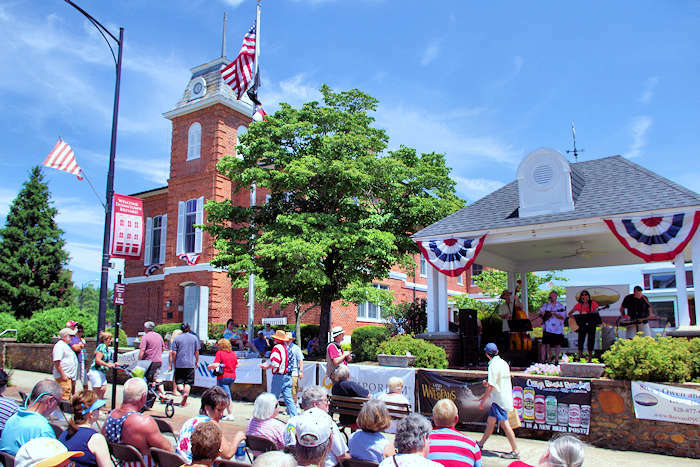 For more things to do in the area, see our Forest Heritage Scenic Byway Guide and our Brevard Guide. Directions: From intersection of US-276/US-64/NC-280 in Brevard, enter Pisgah National Forest on US 276 North. Go 5.3 miles and turn left onto FR-475. Drive 3 miles (paved road) to a small parking area on left at the sign for Cove Creek Campground.